There's never a moment's rest in The Haunted Woods; tonight restless ghost Petpets are rising from their graves to reign terror on Neopians. It's up to you to stop them at their source, by bopping them back into the ground with their own tombstones! 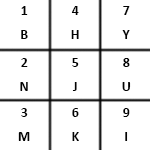 By default, Ghost Bopper is played using the number keys 1 through 9 on the numpad, but this can be changed to nine of the letter keys instead. 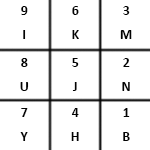 Each key corresponds to one of nine tombstones shown on screen, and when a key is pressed, the matching tombstone will bop whatever has risen from the grave beneath it. Holding a key will repeatedly bash a grave or whatever's beneath it until you let go. The aim of the game is to bop as many of the ghost Petpets that appear to score as high as possible. However, letting a ghost escape, hitting the empty ground or hitting a skull will take away one of your lives. You'll start the game with ten lives, running out of lives immediately ends the game. Lives can be recovered by bopping hearts which might come out of the graves, but the maximum lives you can have at any time is ten. How many Petpets have the people of Haunted Woods been burying here? Ghost Bopper has thirteen levels that each last 30 seconds, the remaining time is indicated by the moon in the background moving from the left side of the screen to the right. To beat a level all you need to do is survive for the entire 30 seconds; the number of targets you successfully hit doesn't matter so long as you still have some remaining lives. As you progress through the game, new ghost Petpets will be added which will take more hits to defeat, but also reward more points. New hazards are also added throughout the game, like skulls which take a life when hit or the pink Kacheek who deducts points when hit. The last and biggest challenge that the game adds on various levels, is rotating or flipping the keys assigned to each grave. This means that the keys you press for each grave at the start of the game will be swapped around later on. See the Strategy section below for details. The main targets you'll be hitting to score points in Ghost Bopper are the ghosts of course. The point value of each ghost is equal to the number of hits it takes to beat the ghost. Points are only awarded once the ghost has been defeated (you will not receive a point each time you bop it), so be sure to finish off every ghost you begin attacking. In the last level of the game skeletons will start popping up, which only take one hit to beat, but give 5 points when defeated. Occasionally gold coins or treasure chests will pop out of graves; the coins are worth 20 points when bopped and the treasure chest gives 10 points and will also reveal either a heart or gold coins for extra points. Sometimes a pink Kacheek can pop out of a grave, bopping these guys deducts 2 points from your score, so be sure to leave them alone. The first thing to do before starting Ghost Bopper is to decide which control scheme you think you'll find most comfortable. 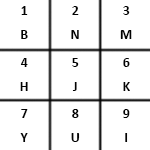 For most people, the default control scheme using the numpad is probably the most comfortable to use as the keys are aligned in a more uniform position than the letter keys. You'll want to pay close attention to which type of ghost you're attacking, because if you try to bop them too many times, you could accidentally hit the empty grave that's left when they're defeated. 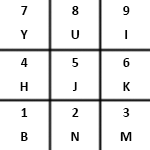 You might struggle to remember how many hits each Petpet takes to beat at first, but as you play more you'll begin to naturally hit each Petpet the correct number of times. 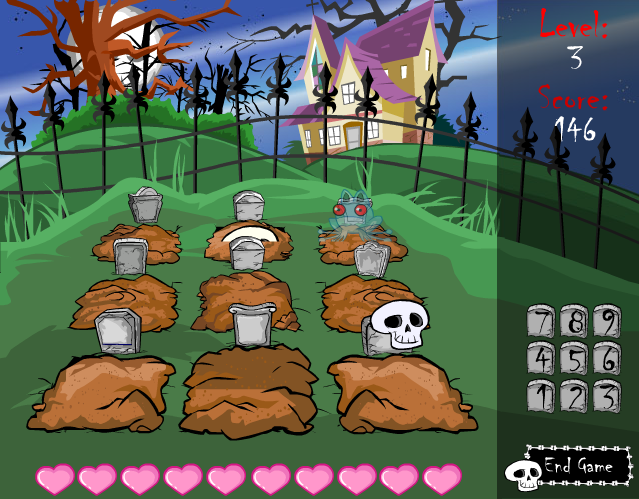 In the last level of the game, a new skeleton enemy is added who isn't defeated by bopping his grave repeatedly, instead you must press the key that matches the one in his hand. To maximise your score, you should attempt to get as many coins and treasure chests as you can, but there is no penalty for letting them escape, which might be necessary if you have a lot of ghosts on your screen that need to be bopped first. If you're able to, on the levels where graves have been rotated, you can physically rotate your keyboard so that the formation of your keys matches the graves on screen. For some of the levels, the graves are flipped in a way that you can't really be replicated with your keyboard, unless you're particularly proficient at pressing keys underneath your keyboard.